Winter can be a treacherous time for business and homeowners when it comes to navigating the icy driveway, parking areas, and sidewalks. 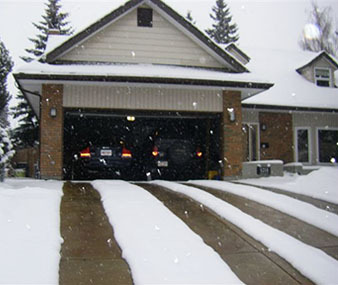 The best way to ensure safety around your house or business is by installing an automated snow melting system. These systems are reliable, easy to install and provide peace of mind for your home or workplace. When you work with trusted industry leader Warmzone, the systems include premier components, superior customer service, installation support, backed by years of radiant heat expertise. Expertise and customer service is key when making such a significant investment, and at Warmzone, full design services are available to get you started off on the right foot. 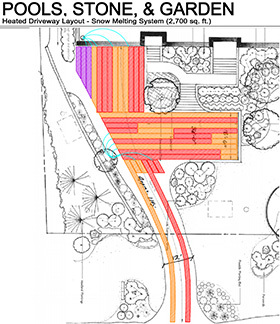 After discussing the project needs with you, a radiant heat expert will design a comprehensive radiant heat solution that is customized specifically for your property. The system layout includes a detailed CAD that outlines your system’s layout and materials, power needs, proper load calculations, breaker sizes, number of breakers, and performance expectations. After you have worked with an expert to design your system, it’s time to start your system installation. 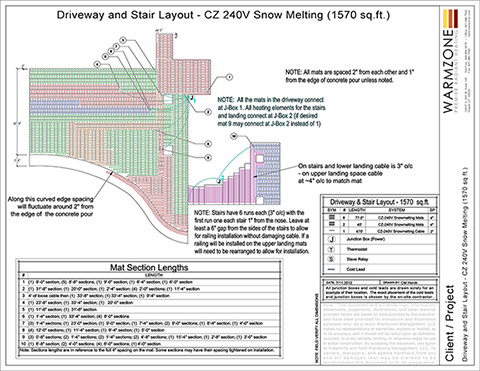 Example of a snow melting system design snowing proper cable layout and technical information. Proper installation is essential to radiant heat systems; that’s why Warmzone offers free installation training and support. Whether you are a professional or a homeowner doing a DIY installation, installation training is available in person or online. Installers can also call our installation experts at 888.488.9276 if they have any questions. 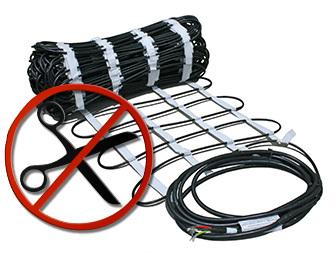 The durable and versatile heat cable is available off spools or in mats that can be easily rolled out for quick installation. Installation for your project begins with this heating cable being laid out and secured to a re-mesh. This re-mesh is supported by plastic Mesh-Ups that keep the heat cable elevated during the concrete pour. (It is important that the cable does not rest on the ground.) 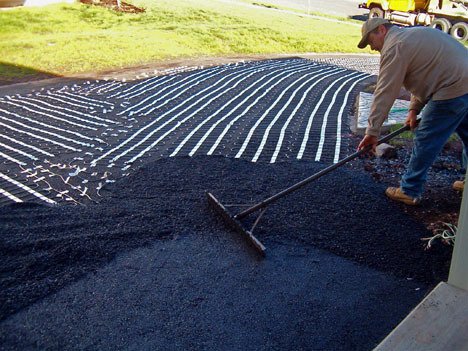 After the cable is laid out and secured, the concrete or asphalt is applied. The next essential piece of an automated snow melting system is the automatic sensor (activation device). 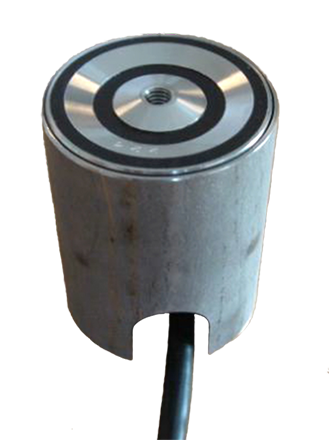 These temperature and moisture sensors can be pavement mounted or aerial-mounted. Aerial sensors are typically used for residential applications, while pavement mounted sensors are generally used for commercial snow melting projects. When the temperature reaches a set point (usually set at 39°F) and moisture is present, the sensor signals the master controller / contactor panel to send power to the snow melting system’s heat cable. There are benefits to both sensors, and each are well suited for particular projects. To continue learning about how Warmzone’s snow melting systems, check out Part II of Snow Melting System Details below. Aerial sensors are typically used for residential snow melting systems (and roof deicing systems). 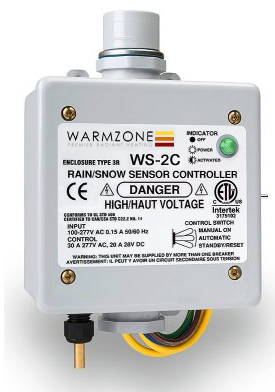 Warmzone’s WS-2C aerial sensor sets the industry standard with new enhancements that make it the most popular and trusted. The activation device has a universal power supply allowing it to auto select input voltage, a redesigned case, and increased moisture control sensitivity. This sensor detects moisture through an interleaved grid at the top of the unit, and temperature is detected by a sensor at the bottom of the unit. The WS-2C is compact and easy to install, features an adjustable set point and has manual, automatic and standby capability. Another bonus of Warmzone’s aerial mounted sensor is its smart system compatibility. When you purchase the optional WS-AUX and CS-1 cable, you can control your system from remote locations through your telephone. Pavement mounted sensors are generally used for commercial projects. The ground-mount sensor is directly mounted in the surface of the area to be heated, which allows for increased energy efficiency without sacrificing effectiveness. When the set point is reached and moisture is detected, the sensor signals the master controller, which activates the ClearZone snow melting system. This unit is only used with a pavement mounted sensor, and is a small NEMA 1 wall mounted control panel. The panel s designed so it can be controlled from an external signal. It can be in standby mode to activate when needed, or can be turned on manually to melt snow drifts or ice that may have formed in shaded areas. Warmzone’s master controller is not only technologically advanced, but is also very affordable. The Warmzone controller provides maintenance free, UL listed, under pavement heating. After the storm, to ensure that the heated area is completely dry, the pavement mounted sensor is equipped with an “after-run” function to ensure complete dryness and no ice formation. A pavement mount snow sensor for automated snow melting systems. When you choose Warmzone for your snow melting needs, not only do you receive premier systems and components, you also receive online resources available at anytime – which include Warmzone’s instructional videos, articles, and glossary of helpful terms. Still have questions about ClearZone snow melting systems? 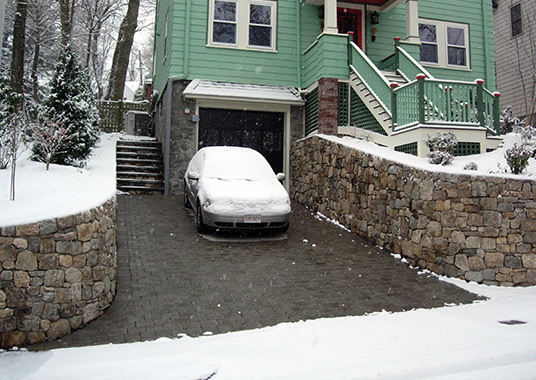 Check out this snow melting system overview and other documentation, or contact an experienced representative who can provide sincere, non biased recommendations based on your needs at 888.488.9276. 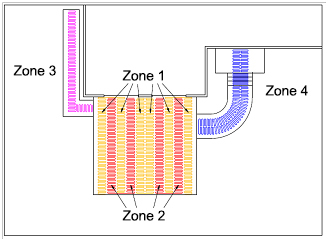 Hydronic or Electric Radiant Heat? Radiant heat systems are a great way to make your life at home or work safer, more comfortable, and simpler. They can be installed under a wide variety of interior surfaces, as well as exterior applications such as walkways, stairs, ramps, and driveways. When considering radiant heat, making the decision between an electric system or a hydronic system can often be daunting. Both types of heating systems have advantages, but it is important to have all the information you need before deciding which is best for your home or business. A hydronic radiant heat system is complex and requires many different components. Hydronic floor heating systems work by heating specially treated water and pumping it through flexible PEX tubing embedded under the surface. These systems use a gas or oil burning water heater (boiler) to heat the water, which is then circulated through the manifold and tubing by electric pumps. At Warmzone, only the most efficient condensing boilers and industry leading components are used when installing a hydronic system. Because of the various components and complexity of hydronic systems, the installation costs tend to be notably higher than those of electric systems. Hydronic snow melting systems also utilize the combination of water and propylene glycol (anti freeze) that is heated and circulated through a closed loop of PEX tubing. In addition to the liquid retaining heat for a time after the system has been shut down, the condensing boiler can be run by almost any energy source. As a result, hydronic systems may boast lower operating costs than those of similarly sized electric systems. This makes hydronic systems a popular choice for large installations. Fully automated hydronic snow melting systems from Warmzone are controlled by premier components, including an aerial- or pavement-mount snow sensor. These sensors detect precipitation and temperature to activate and shutoff the system as needed. One of the most popular forms of radiant heat used today is electric. 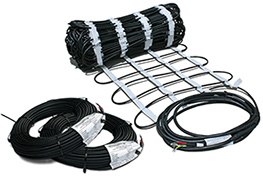 An electric radiant heat system works by using a thin resistance electric heating cable that is embedded in the medium, or directly under the flooring. Electric radiant heating can be installed to warm almost any type of flooring in your home; and can even be added to heat existing floors if the floor joists are accessible. Warmzone floor heating systems are energy efficient and exact, as each separate flooring area/room can be controlled by an individual thermostat. The other advantages of electric radiant heat include easier customization and a more rapid response time when compared to hydronic radiant heat. An electric radiant heating system is much easier to install than a hydronic system, and is commonly used for interior heating applications as well as heated driveways and outdoor applications, including roof deicing. 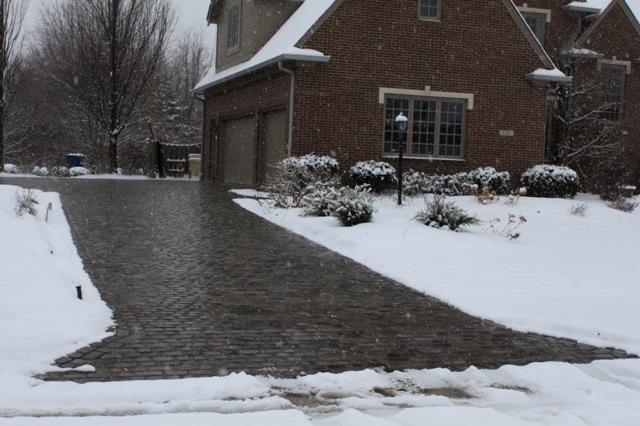 An electric snow melting system heating a paver driveway. A radiant heating system is a great long-term investment that can increase the resale value of your home and make your business safer and more efficient in harsh winter weather. If you still have questions about radiant heating systems please visit Warmzone.com, or contact a friendly Warmzone professional at 888.488.9276.